You have to give the Russian Futurists this: those guys didn't mince words. It was in their 1912 publication Пощёчина общественному вкусу, known in English as A Slap in the Face of Public Taste, that poet, playwright, artist, actor, and filmmaker Vladimir Vladimirovich Mayakovsky (pictured above in the center of a group that includes Sergei Eisenstein, Boris Pasternak, and his muse Lilya Brik) made his literary debut. 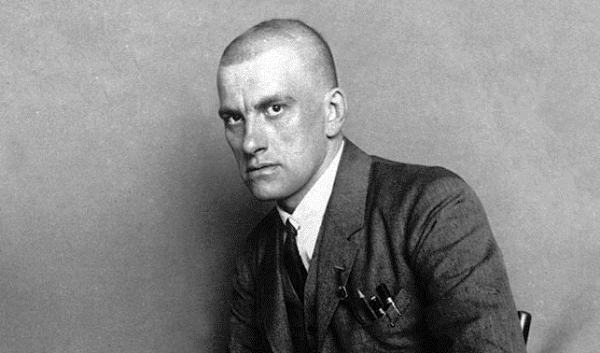 As his sensibility developed throughout the rest of that decade — a time which, of course, included the Russian Revolution — Mayakovsky made himself into an almost anti-poetic poet, incorporating the most common varieties of language, engaging straight-on with politics, and presenting himself as anything but a lofty artistic figure. I read the summons of new lips. a nocturne on a drainpipe flute? Mayakovsky, the complete collection of whose translated poems you can download at Ubuweb, lived from 1893 until his suicide in 1930 — a span coeval with the development of the motion picture. He took to that art form just as he took to others like the stage play and the propaganda poster, and it makes sense that the kind of reality-bending visual mind revealed in his poetry would fall under the spell of that wholly new and dreamlike medium. In his short life — all in 1918, in fact — Mayakovsky directed and starred in three short films, It Cannot Be Bought for Money, Shackled by Film, and The Young Lady and the Hooligan. Only the last of them survives today, and you can watch it below. It's also housed in our collection, 1,150 Free Movies Online: Great Classics, Indies, Noir, Westerns, etc.. More poetry read by great poets can be found in our collection of Free Audio Books. Colin Marshall hosts and produces Notebook on Cities and Culture and writes essays on cities, language, Asia, and men’s style. He’s at work on a book about Los Angeles, A Los Angeles Primer. Follow him on Twitter at @colinmarshall or on Facebook.